Even though eating latkes is a yearly tradition for me on Chanukah, I had never made them myself until now. This recipe from my friend Sarah is so good that I plan to make these every December for the rest of my life! Even if you don't celebrate Chanukah, these potato pancakes are universally delicious. Using a lifetime of latke-enjoying experience, I can personally vouch for the fact that they're the perfect balance of crispy and moist, with fantastic flavor and color. And don't forget the sour cream or applesauce! I served them with a cranberry applesauce that I'll be sharing soon. They do look fantastic! Although I don't celebrate it, I have strong memories of latkes - a friends mom brought a tonne to school in grade one, and I can remember so much about them to this day! I think Santa is bringing me my first food processor for Christmas. These might have to be made as soon as the wrapping comes off! They look amazing! Lemon juice is a nice addition. I've never tried it with. I'll try it next time I make them. Those latkes look perfect! I was planning to make latkes for my boyfiend until he informed me that he doesnt like potato pancakes! I do NOT get that at all!! I hope you enjoyed yours. I am drooling over the pic! I confess, I've never had a latke I loved. They're always fine, but never actually good to me. These, though, look divine! 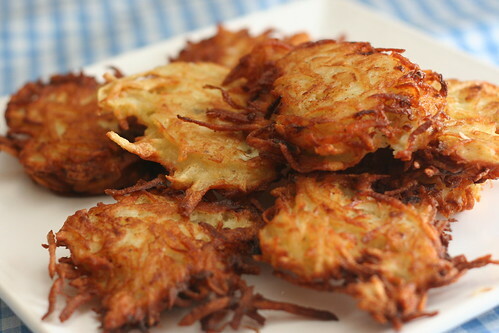 I love latkes (or as I grew up callign them -- potato pancakes). I just made some the other day! I tried the Cook's Illustrated recipe and am hooked on it now... but this one sounds really interesting with the addition of lemon juice! I love crispy latkes and these look very crispy. I see you shred it. I do too but my daughter wants me to use the other blade so they come out smoother. I don't want them smoother. I want crisp.